Source: Andrew Johnson Monument, Carthage. Photo courtesy of Rusty Long. The monument consists of a large rectangular slab of granite standing about ten feet tall, with a large bronze plaque. 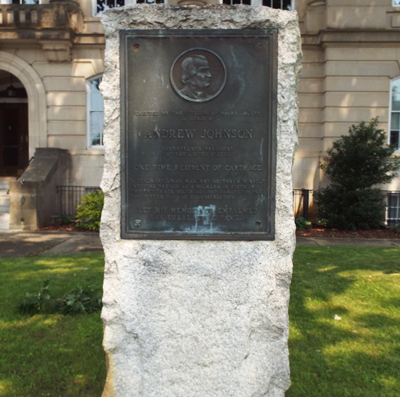 Centered at the top of the plaque is a bas-relief portrait of Andrew Johnson facing to the right. Engraved under the portrait are words from the people of Carthage celebrating Johnson for his actions during Reconstruction. The bronze plaque is 24 inches wide by 36 inches high. 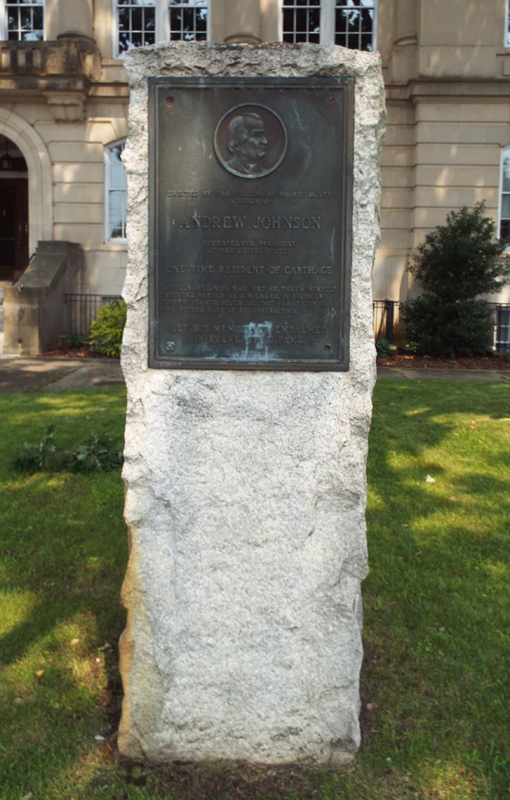 ERECTED BY THE CITIZENS OF MOORE COUNTY IN HONOR OF / ANDREW JOHNSON / SEVENTEENTH PRESIDENT / OF THE UNITED STATES / ONE TIME RESIDENT OF CARTHAGE / A STALWART UNION MAN, YET HE THREW HIMSELF / INTO THE BREACH AS A BULWARK, IN FAVOR OF / THE PROSTRATE SOUTH AGAINST FANATICISM IN THE BITTER DAYS OF RECONSTRUCTION. / LET HIS MEMORY BE EMBALMED / IN EVERLASTING FAME. The date and activities of the dedication are not known. The monument appears in photographs of the historic Moore County courthouse built in 1922. However, it does not appear in photographs of the prior courthouse which burned. The monument appears to have been erected sometime after 1922. 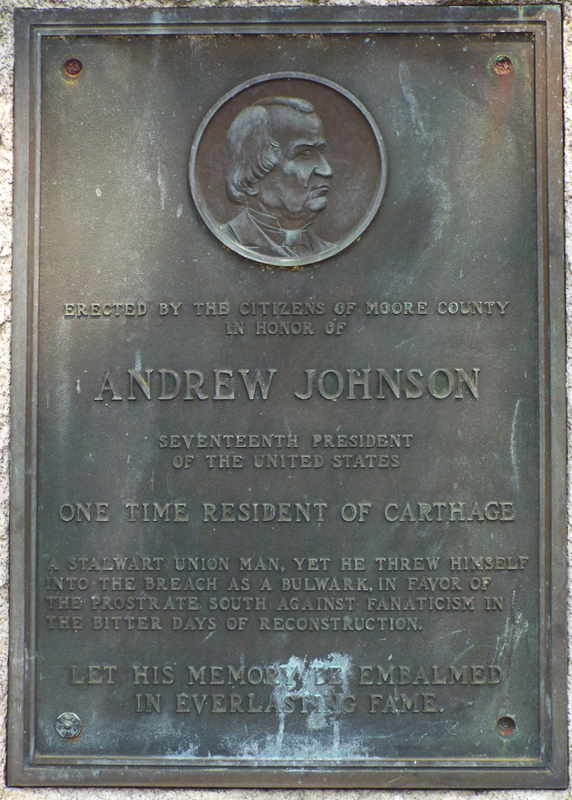 Andrew Johnson, who once resided in Carthage, was the 17th President of the United States. He succeeded President Lincoln after his assassination. Although a Unionist during the Civil War, he adopted policies during Reconstruction that were applauded by many white southerners. He did not promote the rights of the recently freed slaves and granted lenient terms to many former Confederates. Eventually, Johnson was impeached by the U.S. House of Representatives but was acquitted by the Senate. The monument sits in front of the east entrance to the historic courthouse in Courthouse Square in Carthage. Courthouse Square is located along NC Route 24/27. The monument sits on the lawn between the traffic circle and the courthouse.